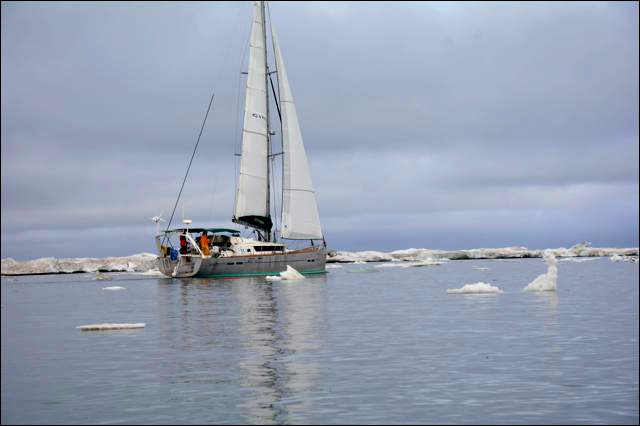 In the two weeks since we had left Dutch Harbor, we passed through the Bering Strait, crossed the Arctic Circle, turned east at Point Barrow and continued along the North Alaskan coast. 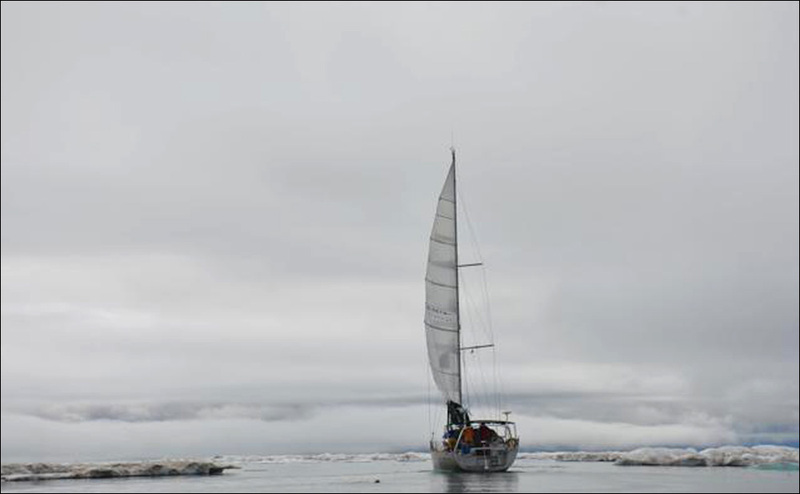 We covered a total of 1650 miles, which is a considerable distance bearing in mind that during the second week we had encountered much ice along the route, sometimes quite concentrated, at other times spread out. 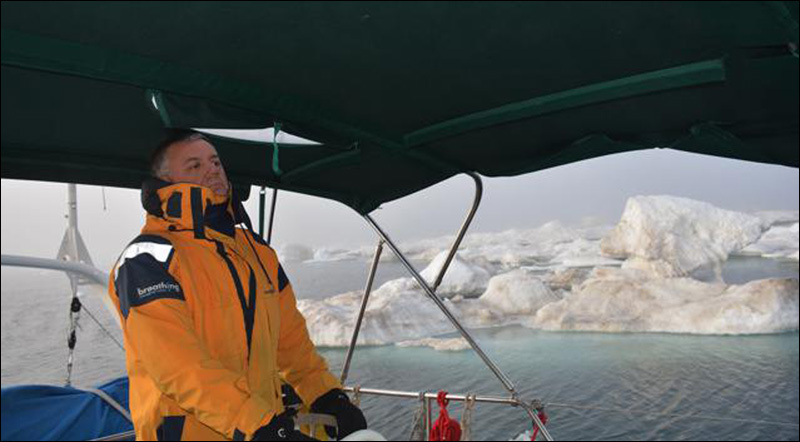 Often we had to power our way through, or push the ice out of our way with our 4 metres long ice poles to find a free lead that would allow us to continue on our desired course. It was a matter of total concentration for the person at the helm, and of certain excitement for the rest of us, and, in spite of the occasional shot of adrenaline as we had to negotiate a really tight spot, we could not miss the beauty of the scenery we were passing through. 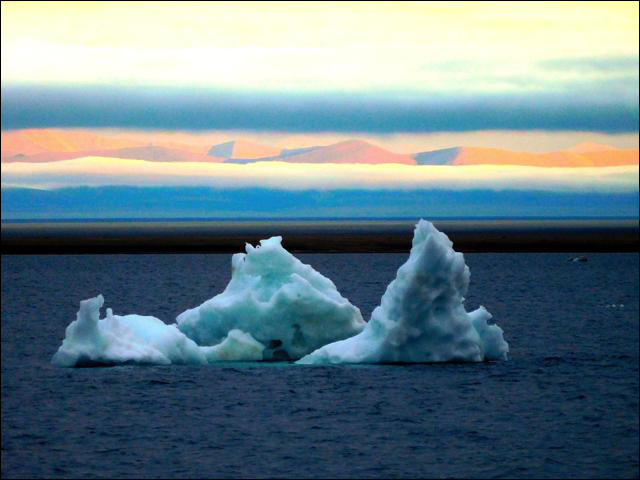 At long last the ice started to thin out, we could relax, and enjoy the absolute beauty of the Arctic. We crossed the demarcation line between USA and Canada, contacted Canadian Coast Guard by email to report our arrival in Canadian waters and were given permission to proceed to our first destination. 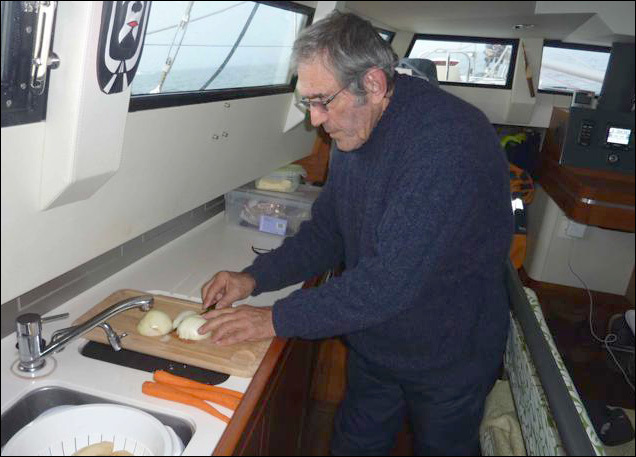 Meanwhile life on board continued as normally as we could make it, with regular meals and watches. Having to pass through areas with high proportion of ice, we had to reduce the individual watch periods to only one hour as maneuvering among the ice required utmost concentration. Also, with an air temperature of zero degrees, it was too cold to spend longer at the helm or in the cockpit. So the crew needed to be fed a substantial diet, like the Hungarian stew I am preparing, with beef (vacuumed packed in Dutch Harbor), potatoes, onions, carrots, cauliflower, and generous additions of paprika as well as herbes de Provence… all cooked in a pressure cooker (8 minutes, if you ask) to save on propane. Martin is a friend from Salt Lake City and can best be described as a true adventurer. 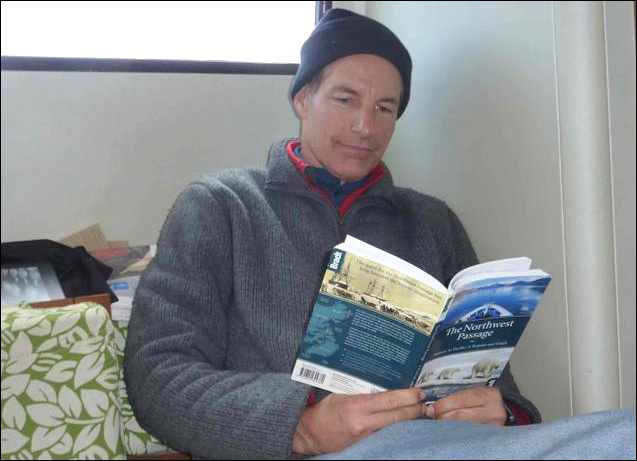 He has climbed Mount Everest, walked to the South Pole, and sailed around the world with his family on their 55 foot catamaran. 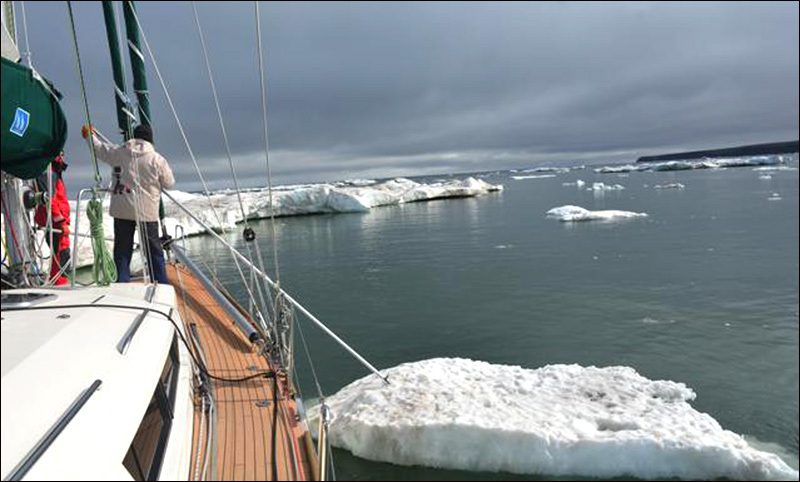 The Northwest Passage is the next challenge to tick off his long list of achievements. 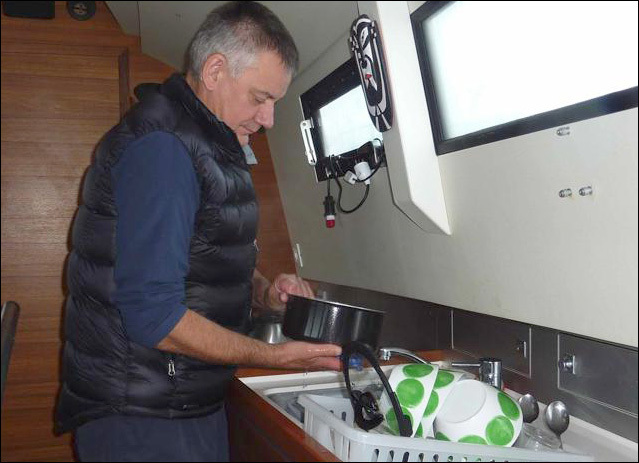 Aventura’s third crew member is Dunbar who had cut his sailing teeth in South Africa, but lived in recent years in London. 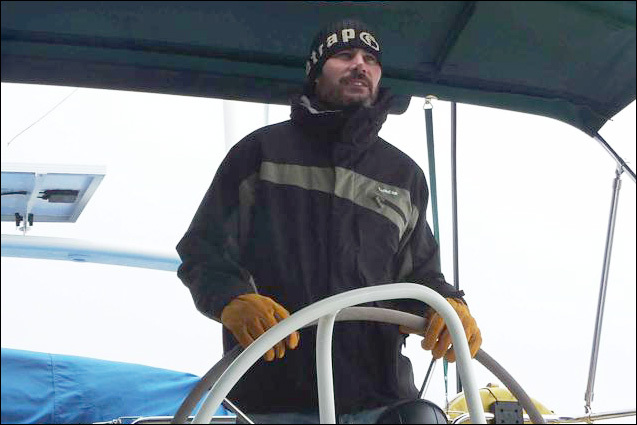 He joined Aventura in Annapolis in December last year, initially to accompany me on my planned round Pacific voyage. However, my sudden change of plan had caught him without proper Arctic gear and we all take pity on him as he shivers in his ski-ing outfit. 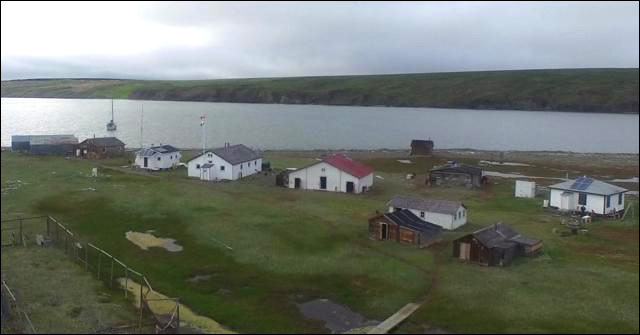 Herschel Island, our first Canadian landfall, was once a busy whaling station and is now part of the Qikiqtaruk Territorial Park. As soon as we landed ashore, we were welcomed by Peyton Lenny one of the two caretakers, who gave us a tour of the buildings telling us the rich and interesting history of each of them. A native Inuvialuit, with a trace of Irish blood from his Fitzgerald maternal grandfather, he told us that the island is only visited by two or three yachts like ours every year. 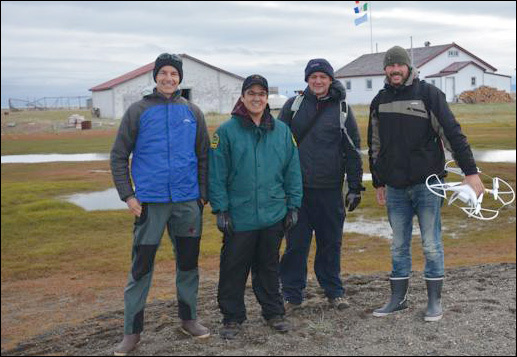 Currently there is a large group of scientists on the island involved in various research projects, from the depletion of the permafrost and resulting massive leaks of carbon dioxide into the atmosphere, to the effects of climate change on the endemic flora and fauna. 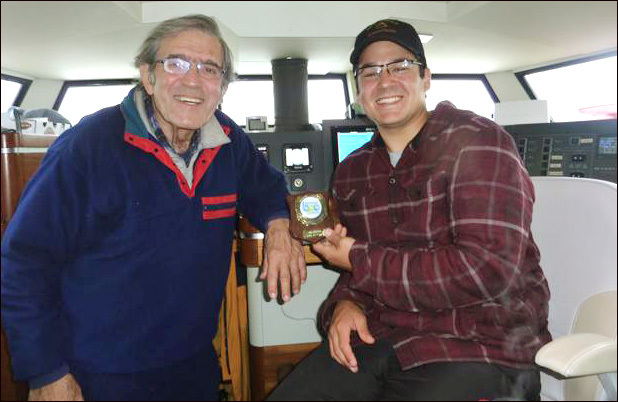 As Peyton had never set foot on a sailing yacht, we invited him on board Aventura, and, bearing in mind the quite visible effects of climate change on this island, presented him with a souvenir Blue Planet Odyssey plaque. 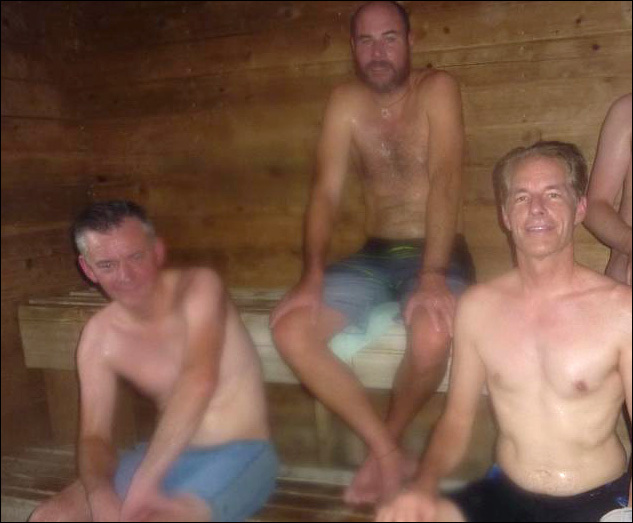 There is an old sauna on Herschel Island and I persuaded Edward Mcloud, the other caretaker, to fire it up for us…. In the end several scientists also showed up. 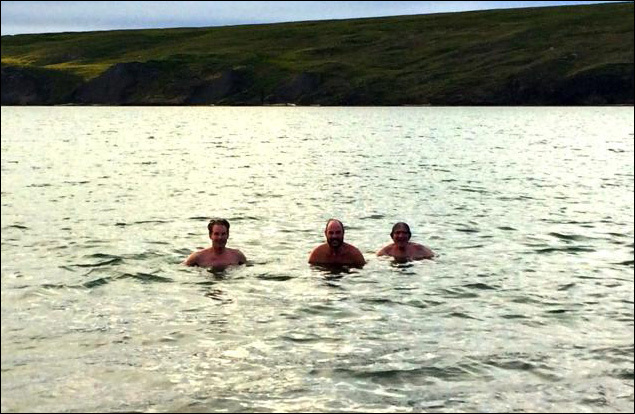 After sitting in the hot chamber for a while, a Finn dared me walk into the sea with him for a proper Arctic baptism. I did, and my crew followed. We shall spend another day here before continuing to our next destination: Tuktoyaktuk, the largest Inuvialuit settlement in the area. 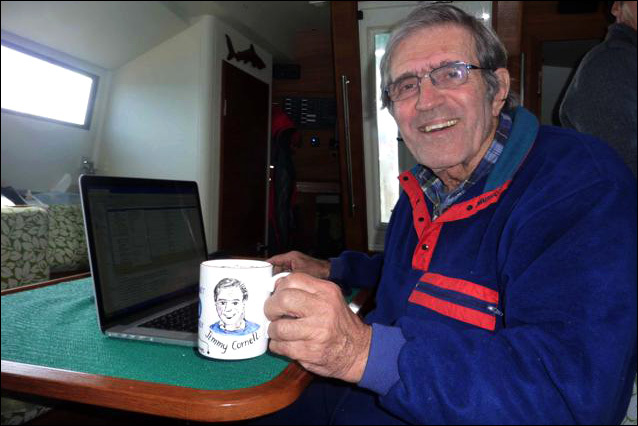 And now, I’ll conclude this report and finish my coffee in this “personalized” mug (looking 40 years younger), a gift from my friends Pradip and Kalpana Patel just before Aventura left London last year.